Lake Mead, near the Hoover Dam and Las Vegas, in an undated photo. The white ring represents water lost from the reservoir over the years as the worst drought in the Colorado River Basin's recorded history continues. There is good reason for the urgency. 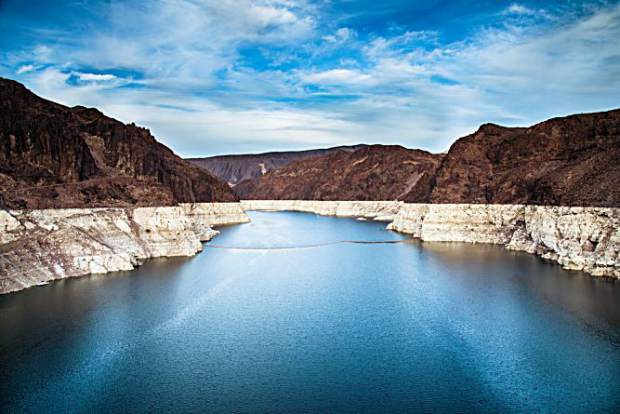 Lake Mead and Lake Powell, which collectively distribute the Colorado River’s water to 40 million people across the West, are at the lowest levels they’ve been since Lake Powell was first filled in the ‘60s. The drought has been continuous since 2000, with warming temperatures and shorter winters leaving less and less snow melting at the river’s source. The feds wanted the drought contingency plans to be in place by this summer to slow down water loss and avoid reaching critically low reservoir levels next summer. If a critical level is reached at either major reservoir, a water shortage will be declared, putting into effect water cutback agreements made back in the ‘20s. Water claim owners with lower priorities, such as farmers, will be forced to cut back on water use and jeopardize thousands of acres and millions of dollars of agricultural industry across the southwest. To avoid that scenario, the river basin states were called on years ago by the federal Bureau of Reclamation to draw up plans to leave more water in the river when certain reservoir levels are reached. The plans would reduce the risk of the reservoirs hitting critically low water levels.